We slip away early from the dog show and head to the Race HQ only to find that the signs to the car parks, that I’m sure were there last night, seem to have disappeared. Eventually we are directed to where to park and we walk across to the start at Northgate Sports Centre. 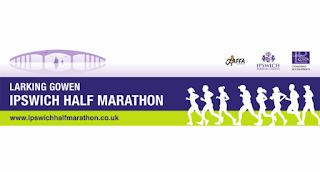 The race is catchingly known as the Larking Gowen Ipswich Half Marathon. Larking Gowen I assumed were a firm of solicitors but it turns out they are actually chartered accountants. Whether this is an improvement or not I’m not sure. 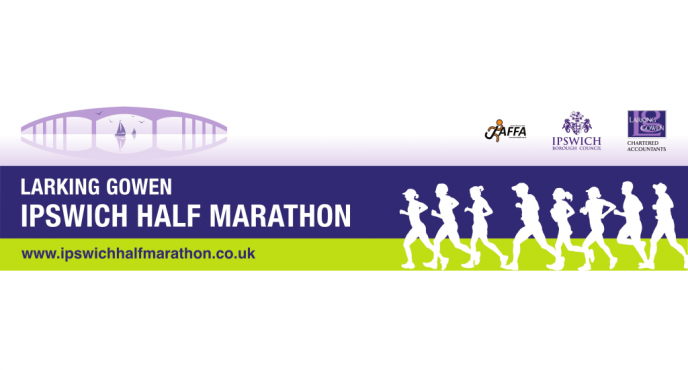 Also involved in the 4th running of the event are the delightfully named Ipswich Jaffa Running Club. Who, yes, run in a delightful orange strip. As part of the Olympic Legacy idea, the organisers have made today’s fun run free to enter. Quite why everybody doesn’t already do this, I’m not sure. I imagine that 95% of event income must come from the main race anyway. It all starts a little early, at 9am, but this is perhaps no bad thing today with rain forecast for 1pm. We head out though a guard of honour of sorts formed by three Olympic Torchbearers. The race itself is a little drab at first, through the local housing estates, but then heads into the rather nice and downhill Christchurch Park before taking a brief excursion along Ipswich’s High Street. After which it’s out into the countryside, which I enjoy, but you could really have been anywhere and it doesn’t showcase Ipswich. That said, there was encouraging support from spectators and marshals everywhere we went. The water stations were good too, plenty of them and all with bottles rather than cups. Tumbling downhill through Christchurch Park was obviously a bad sign because the course had to climb back up and the route in fact proved quite undulating, as well as twisty, throughout. It was not as hilly as Ashbourne obviously but it was certainly not flat either. As we run back into the grounds of the Sports Centre, a big crowd cheers up in through the gates, yet worryingly we still have three quarters of a mile to go. Which means they divert us for a loop around the pathways of the adjacent school, pathways that are devoid of spectators and therefore atmosphere. Which is quite a soul destroying way to end a decent event. Then finally it’s on to the squishy surface of the running track for the final 400m. By now it’s already dawned on me that I’m well up on schedule. I had hoped to break 1:40 today but now a very smug 1:38 was looking likely. In fact, even 1:37 looked possible but I shied away from that thought and anyway it’s best to leave something in reserve (a good excuse, to ease up) to be chipped off in the coming weeks. At last, I feel like I’m getting back to where I want to be. At the end, having bagged 1:38:32, I am handed a better than average medal and a t-shirt. Although I got the size of t-shirt I wanted, this wasn’t the case for many. The later finishers, many being women who wanted Small or Medium, were faced with a choice of Large or Extra Large. The goody bag was good. A drink, a cereal bar, chocolate and not too much in the way of pointless leaflets. As I lie on the floor trying to collect my wits, I hear the announcer telling everyone that free massages are available. So I scrape myself off the floor and go in search. When I got there, there was no queue. The reason for which was apparent later when I saw a child wearing the sign which said 'massage this way'. It was a decent long painful massage, just what the doctor ordered before a three hour drive home, for which I now feel fine. I head back to collect the boys and to meet L, who is running this one as well. She does good, very good, particularly considering she hasn’t really being training for this distance. In all there were just over a 1000 runners. The race would need alterations if they wished to grow it as an event but perhaps they have no wish to. The forecasted rain arrives bang on time as we head back to Trinity Park and get the tent down in time, just. Then it rains all the way home. We stop off to pick up lunch, a coffee and Old Peculiar (as you do) for later from a petrol station. Then it’s home to the indulgence of among other things the OP and a Takeaway curry.